The Euro vs Dollar Currency War is back on the front burner. For years, it used to be a cold war, but now it’s hot again – and Bernie can’t take the heat; it gives him headaches. He should have anticipated that when he accepted Bush's appointment as ‘fedicopter’ pilot-in-chief. With his Ph.D. in Economics – or whatever it is that he’s got hanging on his office wall - he should have known that inverted pyramids invariably topple over but, alas, that’s just common sense. They don’t teach that in the economics departments of major US universities. It’s too basic. Bernie really can’t complain. Maybe his predecessor could have complained, had he stuck around. At least there was no such thing as a "euro" when Greenspan became Fed chief. There was no way he could have anticipated the euro and its effect on the dollar when Reagan appointed him back in 1987. The euro’s function as reserve-currency spoiler was fully known to him when he assumed office. He also knew that the ECB wasn’t about to follow him into the interest rate ditch when push came to shove – but there’s always hope, I guess. The really stressful part in all of this is that there really isn’t anything he can do in his position, given the tools at his disposal. All he can do is use traditional ways of messing around with the US money supply, or try to find more novel ways to affect US interest rates – but therein lies the problem. 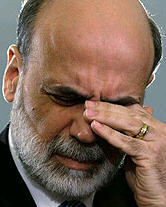 He has no power to affect the interest rate targeted by the Fed's sister institution in Europe. Why is this man hurting? Bernie’s headache is caused by "Tricky" Trichet’s announcement that he will raise the ECB’s target interest rate in July. Bernie just can’t match that without terminally locking up the US economy’s gears. The dollar train has been powering downhill full steam ahead. Bernie can’t suddenly throw the gears into reverse without stripping them, but yet he also can’t just let the train run off the cliff, not if he wants to have some kind of a ‘legacy’, one day. So, he has to stand pat. His hands are tied. Not that this would necessarily keep him from going off half-cocked into some new, stupid direction. Common sense never does seem to intrude on his decision-making process all that much – but in the meantime, Trichet's action does indeed give Bernie this really bad, splitting headache. The European press and political figures are already clamoring for Trichet to lower his rates. They still don’t understand that he won’t do it. Not only can he not afford to do it at this point in time (with 3.7 percent inflation EU-wide and 4.7 in Spain alone), it’s simply not in his job description. His sole and exclusive mandate is to keep euro zone inflation at just below two percent. So far, he obviously didn’t do a very good job at it, so now he needs to play catch-up - and that's what he is doing. Now, Tricky isn’t without his own chronic headaches. He is facing a crisis of confidence in the euro that severely threatens the common currency's structural integrity. Germans – who were never consulted and who never had a chance to vote against euro-accession – are selling any euro notes with serial numbers that reveal they originate from a southern European country like Italy, Spain, Portugal, or Greece. Germans have of late been exchanging those southern notes for euros printed by the German Bundesbank. This does not have an immediate effect on the different notes’ buying power because they are by law exchanged at a one-to-one ratio. Yet, over time, if this process continues, it cannot help but undermine the structural integrity of the entire euro system. The fact that this is happening means, first of all, that Germans are hoarding cash. That makes cash scarce. It also means that many Germans are preparing for either a serious crisis or a final and complete break-up of the euro-zone’s monetary union. They fear that, if the union does break up, the notes circulated by these southern states of the EU will be worth less due to their flailing respective economies, their crashing housing markets, and their prolific price-inflation. In that way, the eventual breakup could be forced by these Germans’ very fear. By force of the supply/demand dynamic, these southern notes should have a lower value relative to the German ones, but the legal framework forces banks to exchange them for German notes on a one-to-one basis. This is very similar in principle to what brought the gold standard to its knees here in the US. Over-printing of paper notes caused Americans to reject them and to demand gold coins until the banks ran out of gold coins. If the German notes are compared to gold and the overly circulated southern states’ notes are compared to paper dollars in the early 1930s, we can see how this system could easily break down. If the people of other northern states follow suit, these states’ euro banknotes will experience vastly increased demand from being privately pulled out of circulation, while southern notes will wash back into their respective countries of origin, kicking their already bad inflation problems into overdrive. It is a very strange aspect of the euro system that the ECB has the final money-issuing authority while the individual states central banks can determine how many of their country’s notes and coins should be circulated at any given time. The individual CBs request them and the ECB determines if it should print them, and all euro notes show on their face which (former) country they are from, even though they are all just "euros." This quirky system may well be what will ultimately do the euro in, but don’t bet on the world rushing back to the dollar in a desperate "flight to quality." Not unless a world-wide dysentery epidemic breaks out, that is - because the dollar will essentially be reduced to toilet paper by then. The most likely result of this problems will be a new EU law that prohibits banks from allowing their customers to discriminate between northern and southern-issue euro banknotes. The EU is an even more centralized and despotic bureaucracy then the US is turning out to be. Hey, what’s the big deal with yet another law - as long as it’s all for the good of the bankers, right? All in all, the dollar's and the euro's woes are not be lost on individual investors, traders, and savers around the world. Price-inflation is rampant everywhere, and not just because it is driven by high demand for commodities. Credit has been far too loose in emerging economies as well as in the West. In fact, the emerging economies of East Asia, India, and Russia outdid the US and Europe on that scale by several orders of magnitude. All of this is resulting in a world-wide, growing distrust of fiat currencies. Even central banks have been seen to turn into net buyers of gold - for the first time in almost three decades. Asian countries are already rushing into gold. Tiny Vietnam even became the world's largest importer of gold during the first quarter of 2008! The country also has a huge price-inflation problem. It registered at 11.6% in 2007. That means the Vietnamese people are the smartest people in the world when it comes to investment choices. The rest of the world will soon have to follow them, like it or not, albeit at much higher gold prices. China’s currency is rising in value internationally while price-inflation kills its purchasing power at home. As other Asian countries import more Chinese goods to take up the slack from waning US demand, their prices are rising as well. Meanwhile, inflation is just as rampant in Europe while US figures show that the actual rate at which inflation rises here rivals that of Vietnam - at least if pre-Greenspan-era formulas are used to calculate it. At the same time, M1 (consisting of cash plus bank accounts, aka "demand-deposits") is seriously declining in the West as a result of the credit crunch - and that spells "credit-deflation" even though prices are rising. That's bad news for the banks. Will Deflation Crash the Gold Price? There is probably enough that could be written on this topic to warrant an entire article, maybe even a book, but the question also has a very quick and easy answer. The answer is "no" because gold is primarily money, not a commodity. It is good for almost nothing except for making jewelry and for using it as money. That's why it's so valuable. Even jewelry is a latent form of money, if you think about it. As the money stock decreases during a credit deflation, it becomes more valuable relative to goods and services, and so its buying power increases. Non-western people know this. Westerners will have to re-learn this lesson the hard way. They will keep their money in interest-paying loser-investments because they believe that cash and gold are "non-performing" assets that earn no interest. In other words, in a deflation, "cash is king" - and gold is cash. In fact, gold is better than paper cash. That should tell you where to focus your investment dollars. In this multi-decade gold bull market, the old investment maxim of "know when to buy and when to sell" has been replaced by "know when NOT to sell!" Euro vs Dollar Gold Monitor subscribers know when not to sell.